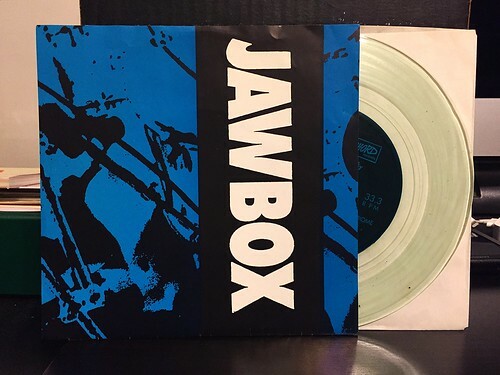 As I've said in the past, I overlooked Jawbox the first time around and have been playing catch up the last few years. I've been picking up their full lengths and when I see them lying around, I try to grab the 7"s as well. This one popped up on the Green Noise site when I was placing another order, so as usual it was the old 'add to cart' button for me. The thing that I noticed the most about this band is that they became much more sophisticated in the way they wrote their songs in a very short amount of time. From album to album (at least on their first three albums, I'm still waiting on the reissue of their fourth) there is tremendous growth as far as the band's sound. That growth it also very apparent listing to this, their first 7" from 1990. All four songs are significantly more straightforward than the band would become known for. There's palm muted guitar into chunky riffs on "Tools & Chrome." "Secret History" showcases some dynamic drumming with a few more varied change ups and a big chorus that kind of sneaks up on you. When "Ballast" hits, the band is at their most upbeat with poppier vocals and lots of fun guitar riffage. Closer "Twister" blasts out with furiously pounded drums in the verse. That moves to a lower key transitional moment into an explosive, big, hooky chorus. While the recording is a little rough and the band is obviously just getting their feet wet, I love this 7". Sure it's not as complex as some of the songs that Jawbox would go on to write, but there's something to be said about a no frill, punk rock 7". I cursed as I saw it was already sold out when I was shopping the site! Good find.